Wow, the past 4 months flown by for me. I've taken a while off from writing and have been documenting my progress on Facebook and Instagram through pictures. In this post, I want to update you on the end of 2016 and send some thanks. Shortly after I wrote Market Winding Down and Future Plans, where I talked about the push back from the local Health Department for selling my produce to restaurants, my contact there went to a conference and talked with the Southwest Regional Specialist from the FDA about my harvesting techniques and whether or not I can be an approved source for a food establishment. I was so happy when he contacted me and validated everything I already thought I was allowed to do. According to the FDA, an approved source is allowed one harvest cut, which is any cut required to harvest the produce, and the produce is not categorized as Temperature Control Sensitive. This has opened up the market stream that I have been looking to enter since I started. I didn't want to begin the conversations with restaurants until I had the OK from the Health Department because I didn't want to say "I have this product but I can't do anything with it yet." In my opinion, this isn't good business and doesn't keep the conversation open. This also allowed me to start displaying my actual greens products on my tables again at the market. This had a direct affect on how much I sold at the last market day at the Amarillo Community Market. The October 1st market day, I doubled my sales from September 27th. This may be partly because it was the last market day but I also feel it was because I had full bags of my greens displayed on my tables rather than a display bag. It seemed, before I received the approval, that people were looking at the price on my board and the bag on display and deciding the price was too high for what they saw. This is a perfectly reasonable response, especially since the actual greens were in coolers and most people didn't see what the actual product was. 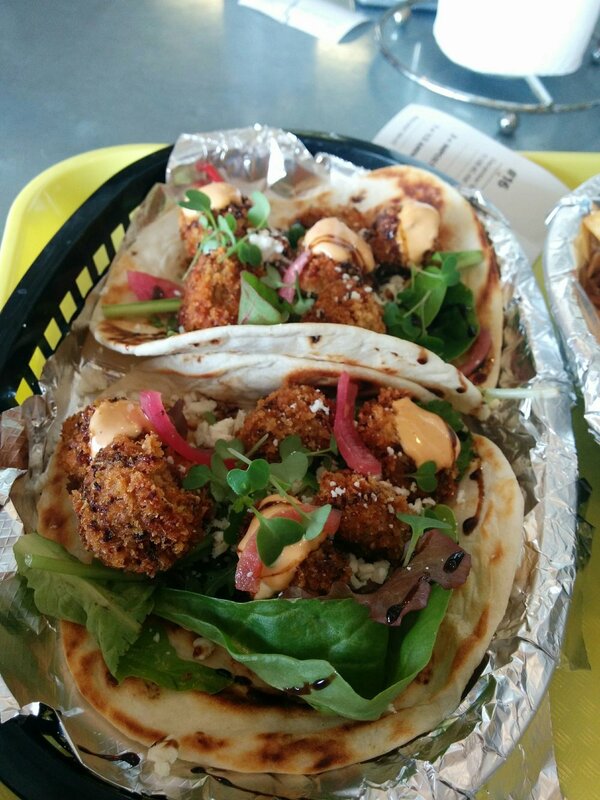 At the end of October, we began supplying our first restaurant, Yellow City Street Food. Scott and Rin Buchanan are awesome to work with. They don't have a set menu and change what they have available almost on a daily basis and want to source as much as they can from local producers. Scott uses my mustard greens in a salsa verde on tacos and uses the salad greens in most of his dishes. The flavor combinations he creates in the food they serve is amazing and the most unique in the area. Its been a pleasure working with YCSF and has given me the experience to be comfortable with talking to chefs and restaurant owners. I was able to provide my produce to Yellow City almost until the end of December. To do this, I used low poly tunnels over my beds. They are a simple, inexpensive way to extend the growing season. I purchased 1/8th inch metal rods from an online garden supply website and 6 mil painter plastic from Lowe's. Setting up the tunnels was pretty easy, push one end of the rod into the edge of the bed, bend it over, and push the other end into the opposite edge of the bed. I used 4 rods per bed. To create horizontal support for the plastic, I looped twine around the middle of each rod and staked each end of the twine to the ground using landscape fabric pins. With the tunnel structure in place, I cut the painters plastic to fit over the hoops with 2 feet extra on each end and a little extra on the sides so that I could weigh it down at each end and along the sides. After that, I laid the plastic over the hoops and secured the plastic to the hoops using spring clips, which I purchased at Walmart, pulling the plastic tight as I secured it to the hoop. To finish up, I weighed down the plastic using scrap 2x4s. 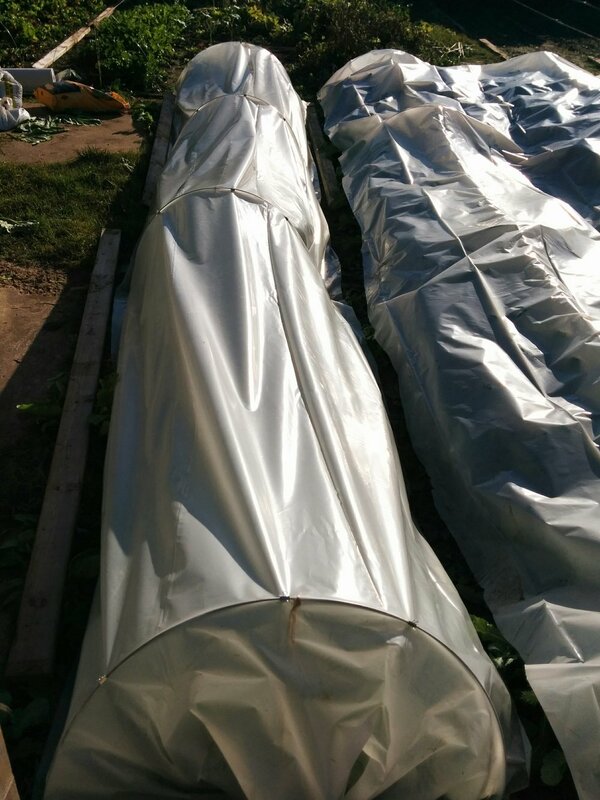 Overall, they worked ok, considering it was my first shot at extending my growing season and low poly tunnels. They allowed me to provide Scott with fresh greens almost until the New Year, but there were definitely some things I will be doing differently next year. The 1/8th rods are just too flexible and don't provide the rigidity needed to support the plastic. They held up great until the wind started to blow. At 20 - 30 mph, the rods would flex and bend so much that the plastic would billow. The clips were not strong enough at that point to keep the plastic secure to the rods and would pop off. On one exceptionally windy day, I would fix one tunnel, move on to the next, fix it, and have to go back to the previous one to fix it again. I decided I just had to wait until the next day when the wind calmed down. Repeating this process worked fine until recently when we had a windy day right before a snow. The plastic got blown off and it remained windy until the next day when it was snowing. This ended the outdoor produce for the year. Finally, because I realized that the tunnels weren't holding up in the wind as well as I hoped, I decided that I needed to figure out a way to keep producing. The best solution I could come up with was setting up a spot to grow inside. Between my garage and back door in my house, I have a small space that has cabinets and counter top. To use this space for growing, I built a shelf using 1x1 pieces of lumber which fit on the counter top in between the cabinets above and below the counter top. I also purchased 2 shop lights, using full spectrum bulbs, which I hung from the top and middle of the shelf, to provide the plants with enough light to facilitate growth. 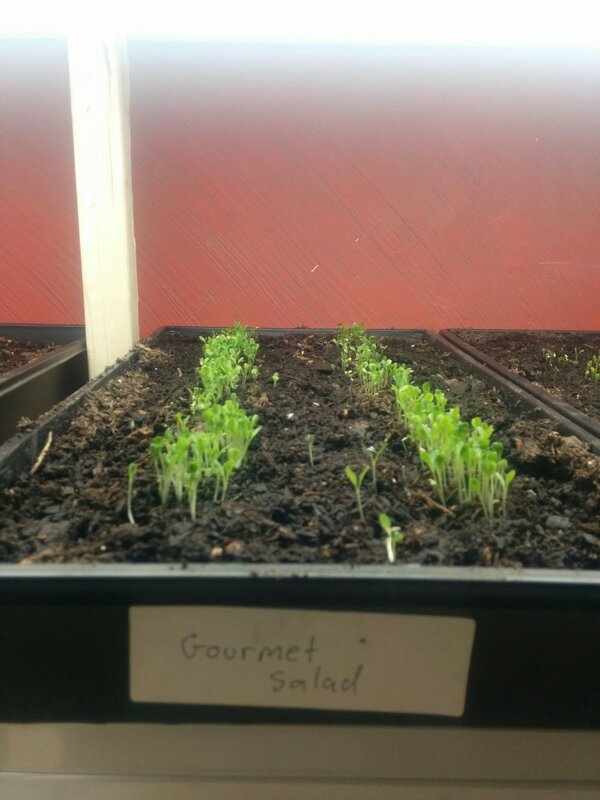 I used 2 inch deep trays that are 21 inches long and 10 inches wide for direct seeding gourmet salad mix, mesclun mix, mustard greens, collards, swiss chard, dill, and cilantro. For soil, I mixed peat moss, organic compost, and garden soil and filled the trays. I hand water each tray every 2 - 3 days. 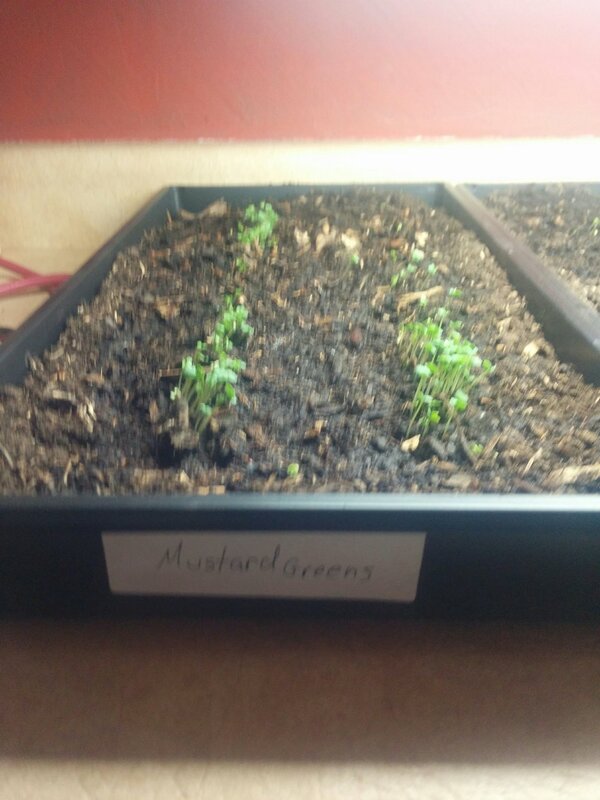 So far, its worked pretty well and got my first harvest off the gourmet salad mix and mesclun mix a couple days ago. 2016 was a roller coaster for me. Half way through I had to deal with deciding what my future would be because the company I worked for for over 8 years was closing. That is what brought me to starting Nuke-City Veg, but I would not have been able to do this without the support of a few specific people and all my customers that came to the Amarillo Community Market. My grand parents, Dietmar and Christa Schoen, gave me money to cover the costs of most of the expenses to get started. Because of them, I was able to purchase my tiller, irrigation supplies, hand tools, and many other supplies. Without their support and belief in me, it would have been so much harder for me to get started. My parents, Allyn and Annette Melius, questioned and challenged me to analyze and make sure that I could pursue this venture and be able to support household while doing this. While they believed in my ability and drive to pursue this, they encouraged me to evaluate and verify the viability to pursue this as a career. Through 2016, their support and openness to the crazy idea of farming my backyard has continued to help keep me going. Mom even started a farmer's & crafter's market in my hometown of Dalhart because of the conversations we had and success she saw coming from me. My girlfriend, Rachel Noble, who I started dating in July, has supported me since the very beginning of our relationship. Her unwavering support and belief in me has kept me going through the highs and lows of getting the farm started. She has continued to challenge and encourage me to keep going and push forward. She stepped in and helped with the work that needed to get done from building up the infrastructure to helping harvesting produce and to calming my nerves when getting ready to talk to Scott and Rin about purchasing my produce. Beth Duke, Lindsey Bird, Timothy Ingalls, and all the volunteers at Amarillo Community Market have created a wonderful market to be a part of. The Amarillo Community Market was the most affordable and accessible place for me to try to sell my produce. Without it, I don't think I would have seen the initial success that I had. The market fees were low, they were understanding, and so supportive and excited about what I'm doing. I was excited every week to go to the market and without their hard work, I wouldn't have had an outlet to sell my produce on my terms. The start up pains have passed and we'll be pushing into our first full growing season in 2017. I've got big plans for the coming year. We'll be stream lining the processes at home base and the partnership with Square Mile Community Development is shaping up to be awesome. I'll be going into the details of 2017 soon. Saturday is the last planned market day for the season at Amarillo Community Market. Everyone at the market has been amazing, from the customers to Center City. You guys have made this a total success for me. I started off super small only bringing 8 quart bags of butter crunch lettuce and last week I brought around 125 lbs of produce, 20 lbs of gourmet salad mix, 20 lbs of mesclun mix or spring mix, 10 lbs of mustard greens, 50 lbs of cucumbers, 20 lbs of radishes, and 5 lbs of tomatoes. We have consistently increased our sales every weekend. This is directly related to you guys, my customers, and none of this would have been possible without y'all. Center City taking the time to setup an affordable, high profile market in Amarillo has been a Godsend for me. Lindsay, Timothy, and Beth have been working so hard to make the Amarillo Community Market a success and they have knocked it out of the park. They have been working on the market since April, which is just after I decided to make Nuke City what it is today. Their market has given me the platform and the exposure to make my field fresh produce available to you. I'm looking forward to next year and being a part of the Amarillo Community Market again. Its been a wonderful market so far and I know they will continue to improve and support the market for local producers here in Amarillo. Since the market here is winding down, I've been exploring ideas to continue to get my produce to customers in the off season. I really want to get my produce into local restaurants but I have hit a bit of a road block with the Health Department. Because of the way I harvest the greens, like the gourmet lettuce and the spring mix, they categorize it as Temperature Control Sensitive food. The method I use is "cut and come again," meaning you can harvest it and it regenerates in a week or so and I can harvest it again. The Health Department, while they have been trying to work with me, are saying that I am not allowed to sell the greens to restaurants because they are not "whole or intact." I can sell to restaurants if I pull the entire plant from the bed but because I'm working on a small footprint I would not be able to have produce available week after week. The greens take about 20 to 25 days after planting to be ready to harvest. I would need 3 times as much land to be able to produce the same amount of greens if I pulled the plant completely from the ground as I would need using the "cut and come again" method so selling to restaurants right now is just not economical for a small urban farm like mine. So unless something changes, I can't sell to restaurants simply because I would not be able to meet their weekly demands for produce. The other option I have is starting a Community Supported Agriculture program. In a CSA program, customers usually sign up for a weekly produce box, pay in advance, and receive a standardized box of produce. I am currently setting up a CSA program here on the website but with a little twist. After you sign up for my CSA program, you will get access to the produce page. This page will have the produce that will be available for the week. This page will function like any other website's products page and each item will have its own price. You will be able to select which items of produce you want each week in any combination. If you want just tomatoes one week just pick that. The next week you can choose the gourmet salad mix, cucumbers, and radishes if you wish. Also, if you refer someone and they become a member of the CSA, you will receive a 20% discount code that you can enter at checkout. This will be a one time code and you will receive a new code for each new referral. I'm also playing around with setting up a way to give you discounts after so many consecutive purchases. To get the produce you order to you, every week I will communicate with CSA members on whether or not I am able to deliver to their house or if I need to setup a point where everyone can come to pickup their box. I am currently working on ironing it out and will be releasing it in the next week. I have also decide to partner with Square Mile Community Development. A new non-profit in Amarillo that is focusing on the San Jacinto neighborhood to help improve the lives of the residents. Currently San Jacinto is a food desert. There are no grocery stores that sell produce, residents have to leave the neighborhood to get healthy high quality food. That is one of the areas where I can help Square Mile. They plan on opening a small produce store where they will sell produce at affordable prices to the community. As they get further along in those plans, getting my produce to them is going to be a priority. I try to make sure my produce is of great quality and I do my best to price my produce in a way that is accessible for everyone. They are also looking to help residents through education. 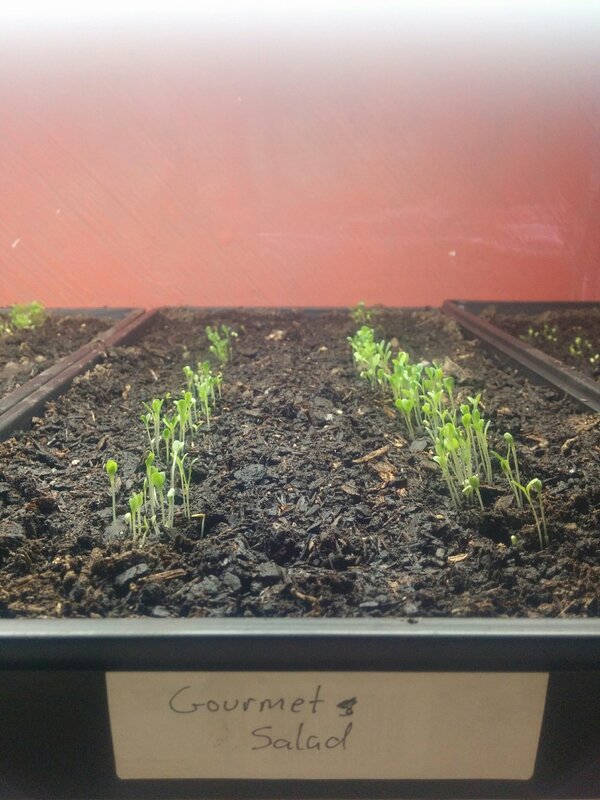 I'm still learning this micro-farming thing, but I feel that I can impact peoples lives by helping them setup their own gardens through education. Partnering with Square Mile is a big step for Nuke City and one that I am extremely looking forward to. It will help improve a neighbor hood that needs help and give both our organizations support and encouragement where we need it. The future is bright here at Nuke City. Its all thanks to you guys. Thank you very much for making this market season a success. 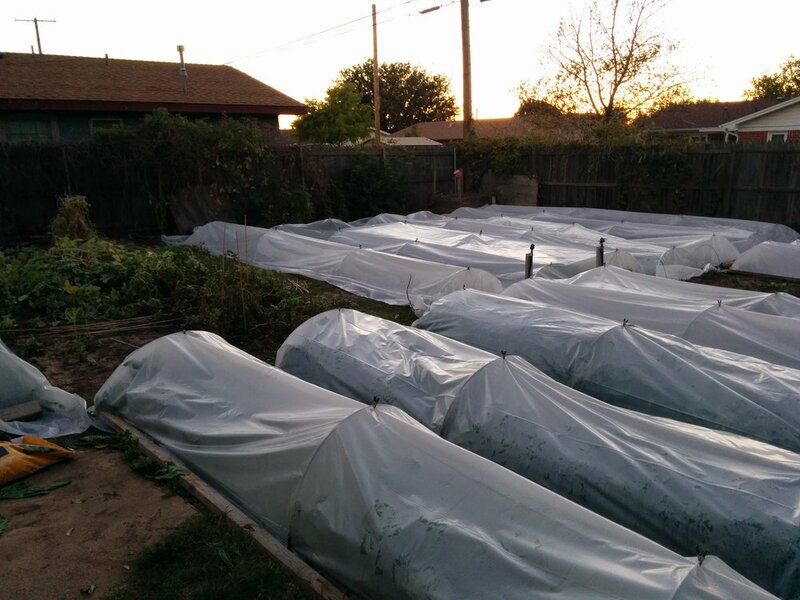 For the winter season, I will be setting up hoop houses over the beds to protect them from the cold. I will document the process as the season progresses. Again thank you for stopping by to checkout whats going on here at Nuke City. planted 3 more beds of gourmet salad mix, 5 beds of mesclun mix, 3 more beds of radish, and 2 more beds of mustard mix. At the Amarillo Community Market on August 20th with salad mix, cucumbers, baby carrots, and bell peppers. Once again another month has passed and so much has happened to the garden, my backyard, and at the market. 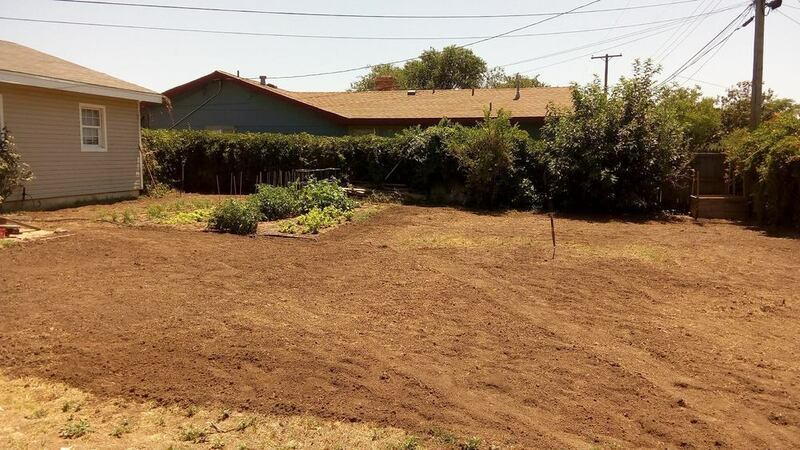 The irrigation system has been finished, I was able to squeeze in 23 beds into the backyard, and I have planted 19 of those beds with seed, which have already sprouted and are already getting close to being able to harvest. I am having so much continued success at the market that I can't wait until the week's market day. 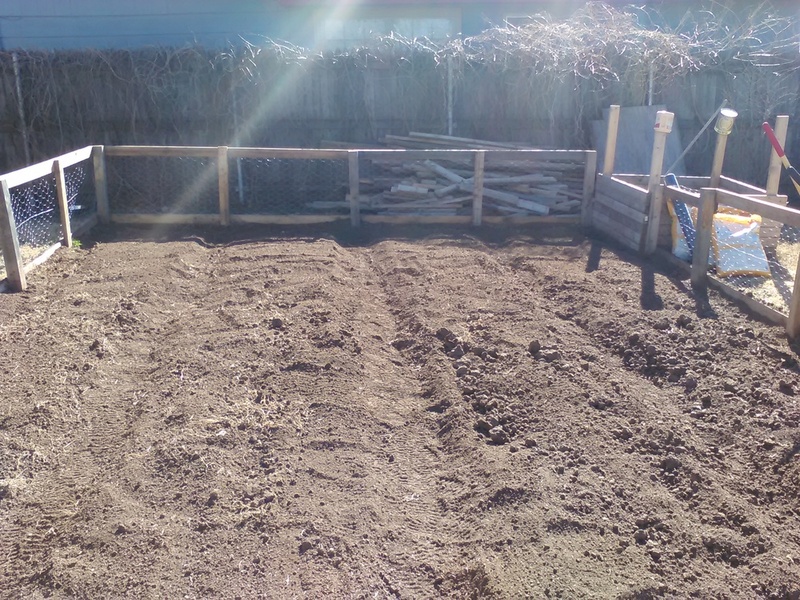 I tilled the entire backyard one more time after the last blog post. 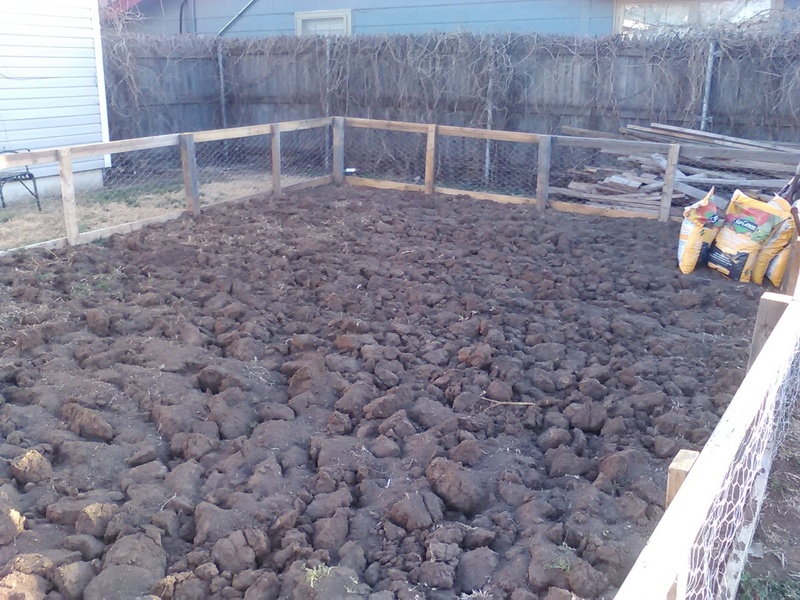 After I finished, I raked it all flat and began to rough out the beds. 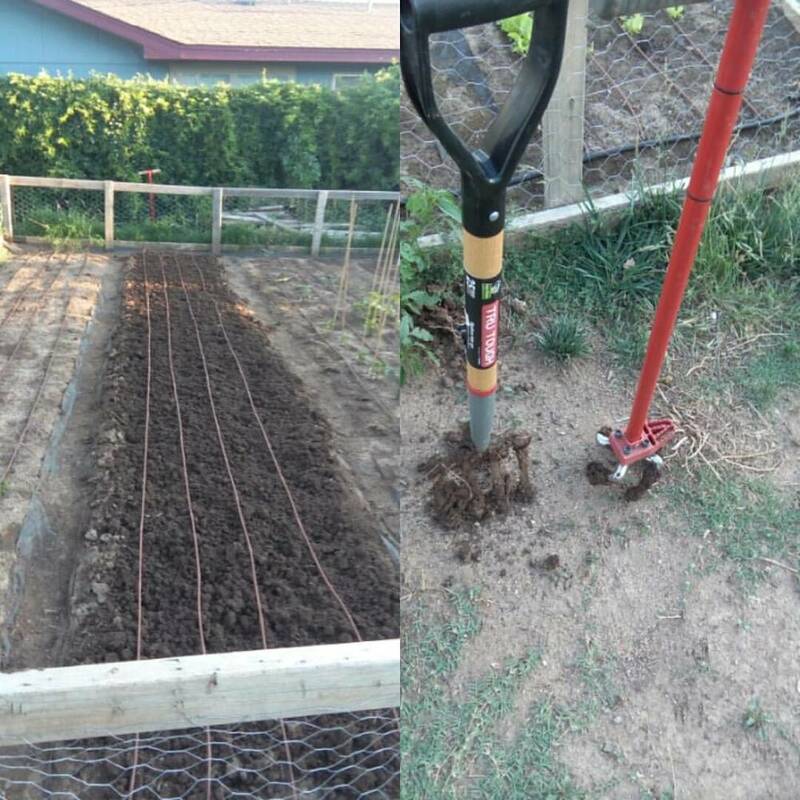 At first, I started by using my rake and creating small paths in between the beds but it was taking me forever and I was trying to think of a quicker way of doing it. The most simple answer is usually the best and I decide to just walk in a straight line and drag my right foot along. Because the dirt was already loose, this made the process so much faster. I wasn't bending over and trying to get straight lines using the rake. I just walked toward a point at the edge of the garden and bam beds! I also had pictures of the beginnings of my irrigation system in the last post. The manifold holds water and does the job perfectly. To work the valves in the manifold, I hooked up the wires for the valves to a regular 4 station indoor/outdoor sprinkler control box, which is plugged into an outdoor rated extension cord. I initially setup 7 impact head sprinklers but reduced that to 6, when I realized that I didn't need the first one. The sprinklers are divided into 3 stations, 2 on the far left side of the yard, which run at 45 degrees, 2 on the right side, which also run at 45 degrees, and 2 in the middle, which run at 180 degrees. They are attached at the top of 2x4s by circle clamps with 1/2 inch irrigation tubing running down to the ground. Then each section is connected back to the manifold using the same 1/2 inch irrigation tubing. After it was all setup, alittle bit of tinkering to get the sprinklers to barely overlap and not spray too far and it was done. After the beds were roughed out and the irrigation system was done, it was time to concentrate on the beds themselves. I once again used my 10 inch cultivator to really grind up the soil in each of the new beds and reformed them. I repeated this process 2 or 3 times. On August 11th, I had 10 beds that I felt were ready for planting. I planted 2 beds of gourmet salad mix, which has 5 varieties of loose leaf lettuce, 2 beds of mesclun mix, 2 beds of easter egg radishes, 2 beds of mustard greens, 1 bed of dill, and 1 bed of cilantro. 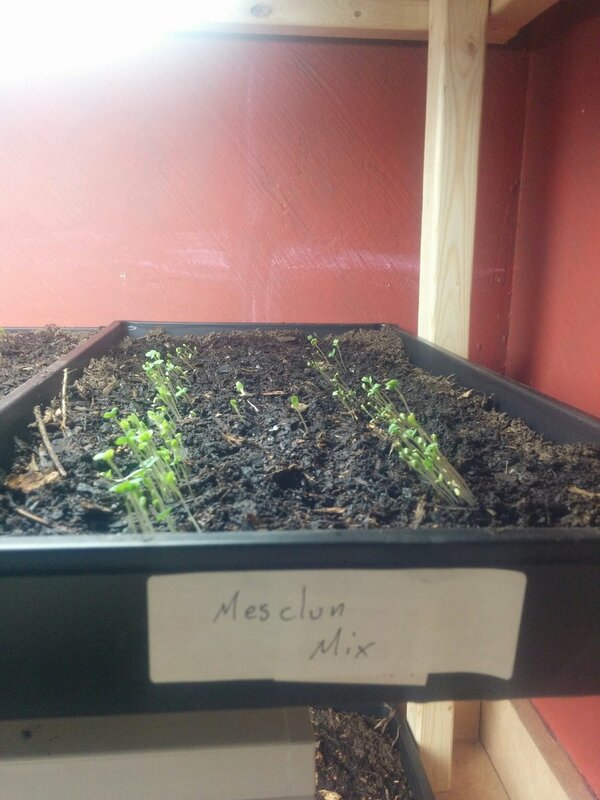 On everything except the mesclun mix, I had germination with in 4-5 days. This took me by surprise because normal germination time is 7-10 days. The beds I planted with mesclun mix didn't germinate because of an irrigation issue. One of the middle sprinklers was not rotating so they were not getting enough water. I waited about 2 weeks to plant the rest of the beds and during this time I used the cultivator on the beds that hadn't been planted a few more times. 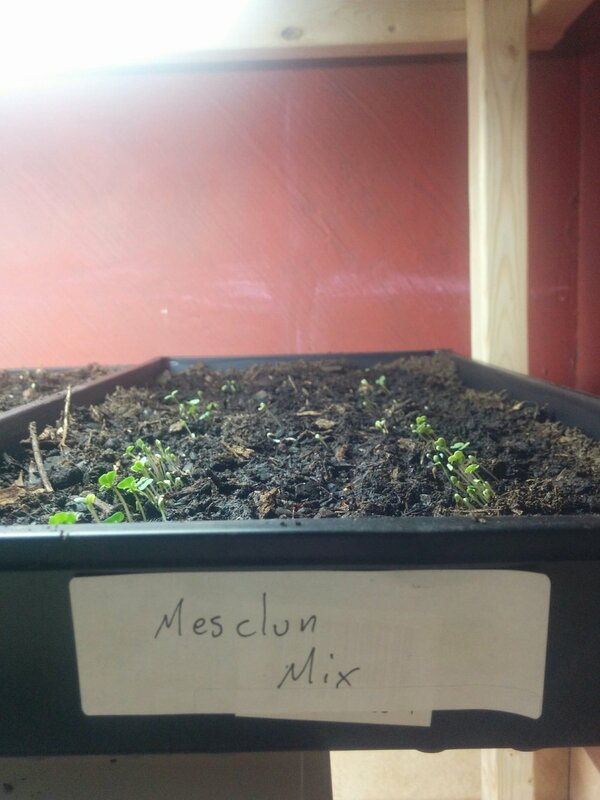 On the 25th, I planted the rest of the beds and replanted the mesclun beds. I already have germination on them too. This time it only took 3-4 days. Its so exciting watching all the growth happening. In total, I now have 5 beds of gourmet lettuce, 5 beds of mesclun mix, 4 beds of easter egg radishes, and 4 beds of mustard for greens. I'm going to be crazy busy in the next few weeks harvesting and getting product ready for the market. The Amarillo Community Market has been amazing so far. I could not have signed up for a better place to sell my produce. There are tons of people that come out every weekend to buy from vendors at the market and the vendors are all friendly and excited about what everyone else is doing. I've already had multiple customers come to my booth raving about the salad mix, squash, cucumbers, and carrots that they have purchased from me in the past weeks. They can't get enough and I'm usually close to selling out after about an hour and a half. Now that the expansion is finally finished and I have plants growing in the new beds, I can finally have the volume to fulfill the demand I see every weekend. Come by my booth on Saturdays at the Amarillo Community Market on 10th and Polk and keep dropping by here to see more updates and blog posts. July 23rd, we had 11 bags of butter crunch lettuce, 5 bundles of baby scarlet nantes carrots, and 7 yellow squash. sold out in an hour. the beginnings of the new irrigation system. 4 valve manifold with 1 spout for a regular water hose. The expansion of the garden has begun and my first two market days were a great success. On the first market day, July 9th, I only had 8, 1 quart, bags filled with butter crunch lettuce. They flew off my table at $2 a bag. Selling out in less than 30 minutes was surreal. It validated everything I have been working for for the past 6 months since I started this journey. Through all the ups and downs, hard work, and personal changes, this showed me that I'm on the right track and that making money at this is definitely possible. It was complete validation and I came home with even more fire and desire to accomplish my goals with the garden. Because I haven't expanded yet, I wasn't able to make it to the second week of the market. My lettuce hadn't recovered yet from the cut I did on the 8th so I had to skip the market on the 16th. I came back strong on the 23rd though. I brought 11 bags of butter crunch lettuce, 5 bundles of baby scarlet nantes carrots, and 7 yellow squash. Titus came along with me and he actually made the first sale of the day with 2 yellow squash right off the bat. We ended up selling out in about an hour. I was surprised but I shouldn't have been. Everyone coming to the market is super friendly and excited to have fresh produce. They all seem excited to have a local grower bringing vegetables to the market from a backyard similar to theirs. Also, nearly everyone that passes the booth either chuckles at the name Nuke City Veg or has to ask what the name means. Its a great way to start the conversation to make the sale. I just thought that the name was clever and funny but its actually a great selling point, which was completely accidental. I'm excited for many more market days between now and October 1st. 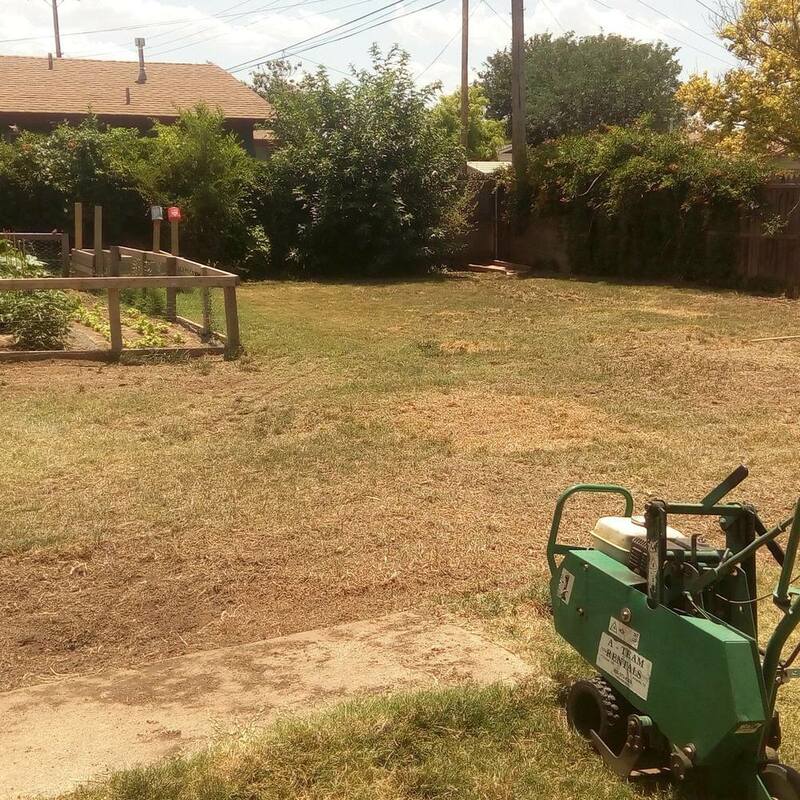 After the success at the market July 9th, I came home and immediately got to work cutting up the sod with my little cultivator, excited to expand what I already had. I should have waited though. By the afternoon, I went and rented a sod cutter from a local equipment rental. Because I had used the cultivator on the grass already, this made using the sod cutter on the grass more difficult because of the lines cut into the grass. I had to follow the path of the cuts I had already made in the grass. Also, I'm not a big guy and the sod cutter basically took me where it wanted to go. I got it done and it was alot easier than using my little cultivator but it was hard work and I was exhausted by the end of it. The next step was pulling the grass off the backyard. I let the grass sit for a day or 2 to let it die. I don't have a wheelbarrow so I had to collect the grass into a large trash can and haul it out into the alley to dump. This was an amazing workout though I wouldn't recommend it to anyone. By the end of it my arms and back were so sore I could barely move. Looking at the end result It was totally worth it though. During this time I began looking for a larger walk behind tiller on craigslist. I knew that my little cultivator would take forever to break up the dirt and I need something bigger. I found a 17" walk behind tiller on craigslist for $600. I brought it home and started tilling. The tiller is awesome. I was able to till the entire backyard in just a few hours. It plows through the dirt in a way that the cultivator can only dream of doing. After running the tiller over the backyard, I raked up all the residual rhizomes from the crab grass into piles and removed it all to the alley using the trash can once again and let the backyard sit again for a few days. I then raked the back yard again. Last night I got a good amount of rain on the backyard and I'm getting ready to hit the backyard with the tiller again. Once I have tilled again, I will rake and then see how well the little pieces of grass were removed. If I'm happy with the result I'll begin forming the beds using the tiller, if not I'll till the entire backyard again. Its a process but I know it will pay off and lead to more and more produce for me to bring to market in the near future. reseeded with lettuce, mesculin mix, spinach, and kale. hand distributed. 1 gallon ziplock bag worth. Before and after of first lettuce harvest. More Lettuce to harvest, tomatoes need taming, so do the cucumbers. So it seems like I can't do more than 1 post per month. Tons has happened since I wrote a blog entry. My fellow employees and I were notified in the middle of last month that the company we work for was in trouble and the owner was going to sell. This was alot to take in and I immediately began trying to think of alternatives if the worst were to happen for me in my career of what to do. I've been with the Company for 8 years and I have come to the realization that I want to transition to working for myself. This garden was the means for me to do that. I planned on slowly figuring out how to implement the procedures and systems that Curtis Stone uses. Here is a link to his youtube channel for more info on him and what he does - https://www.youtube.com/CurtisStone. Now it seems this is the best time to dive in and just go for it. So my 400 sq foot garden is going to be transformed into a 1/10th of an acre micro-farm comprising most of the backyard and probably about half of my front yard. In the book that Curtis Stone wrote, The Urban Farmer, he lays out the possibility and viability of having a farm on this small of an area. I should be able to fit 36 25 foot by 30 inch beds on that size footprint. 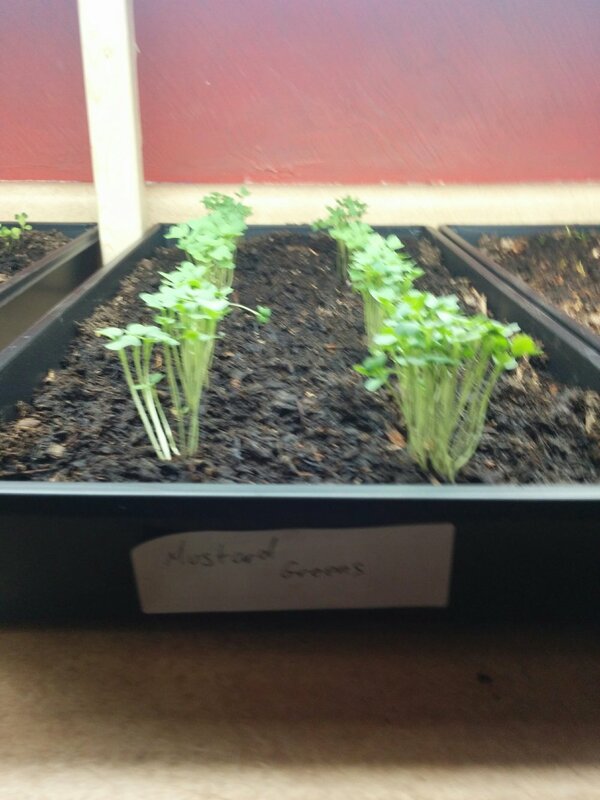 These will be planted and rotated with quick growing crops that have a date to maturity that is less than 60 days like cilantro, dill, mustard greens, various types of lettuce, spinach, tatsoi, mizuna and sprouts. Another benefit of using crops like this is that they can be harvested multiple times on a single planting. According to the math provided in the book using conservative numbers that Curtis has experienced on his own farm, the profit from a farm this size can be in excess of $58k. This is achieved by selling the produce at farmers markets and directly to restaurants. Today, I signed up to be a vendor at the new Amarillo Community Market, a brand new local market for local producers of goods. I won't be able to make it to the market until late June to mid August but the market opens on Saturday July 9th. I plan on being there as much as possible meeting the other vendors and mingling with customers. I'm also going to look into joining the farmer's market in Canyon but they have the market on saturday's as well so that is a slim possibility that I might pursue further in the distant future. Restaurants are completely different animal all together. 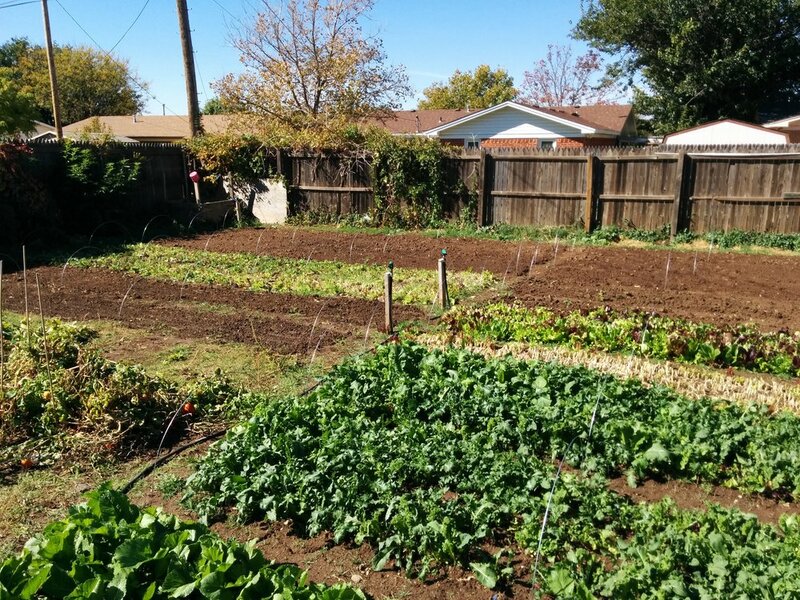 Finding owners/chefs in the Amarillo area that would want locally produced greens might be tricky. I know Amarillo has a high number of restaurants but I need to get those initial contacts made. That's where you the reader comes in. Please share this with anyone you want to. The more the word gets out the better. I will be putting together a google doc that will contain a questionnaire with things like pounds of produce the restaurant uses in a week, top 5 or 6 vegetables they use the most of, things along those lines to take with me once I have made contact with the owner or chef to set up the best time to meet with them. Thanks for being patient with my sporadic posts and continuing to stop by and reading about my little gardening adventure. This is a crazy big step for me but I'm excited and stoked that I can share the journey with all of you. The garden is finally finished and has plants growing in it! Its been a long month and I decided to take a couple weeks to rest and gather my thoughts for this post. I've gotten so much done and this entry might be long winded. Its been a productive month though, I finished laying out the landscape fabric, tilled and shaped the beds a couple more times, harvested radish greens, installed a drip irrigation system, planted a bunch of seeds with an Earthway Seeder that I purchased on Ebay, and transplanted my bell peppers and tomatoes. Almost two months ago, in Another Month On!! , I only had 2 rows of landscape fabric down in between 3 beds. After a couple windy weekends, I finally had a Saturday that was nice and calm, which allowed me to lay down the last row of landscape fabric in between the last 2 beds and got the perimeter done too. For the landscape fabric around the perimeter, I used the staple hammer to secure the fabric to the fence, as close to the ground as possible. Then I used landscape fabric pins to hold the landscape fabric into the ground. On the final strip at the back of the garden, I got the bright idea to secure the fabric to the fence all the way across and then push the pins through the fabric to the ground, which made that one side go super fast. On the other pieces, I stapled and pinned as I went along the fence, which was slow and frustrating. I'm sure Taylor was laughing from inside the house watching me leaning over the fence wrestling with the fabric, staple hammer, and pins. The radishes were abit of a bust. Because I just scattered them out into the bed, they weren't spaced far enough apart and didn't really radishize. They just stayed white tubers. I was kinda bummed about that but what can you do? Titus and I pulled them out of the bed and washed them. I took them inside and picked the best leaves I could find and separated them from the stems. Washed them one more time and served them as salad with spinach that night at dinner. Taylor and I really liked it, the boys not so much. I kept a 1 gallon bag of the greens for future use. Before I installed the drip system, I used the tiller really quick on each of the beds and leveled them out. Then I assembled the Earthway Seeder I purchased on Ebay. This was a pretty quick process. It did come with instructions but putting it together was pretty simple. It came with 6 plates that go inside the seed hopper which have a little groove for the seeds that picks them up and drops them into a shoot which leads to the ground and drops them into the furrow created at the bottom. The plates can be changed out depending on what you are seeding so that you get the correct distance between each seed. 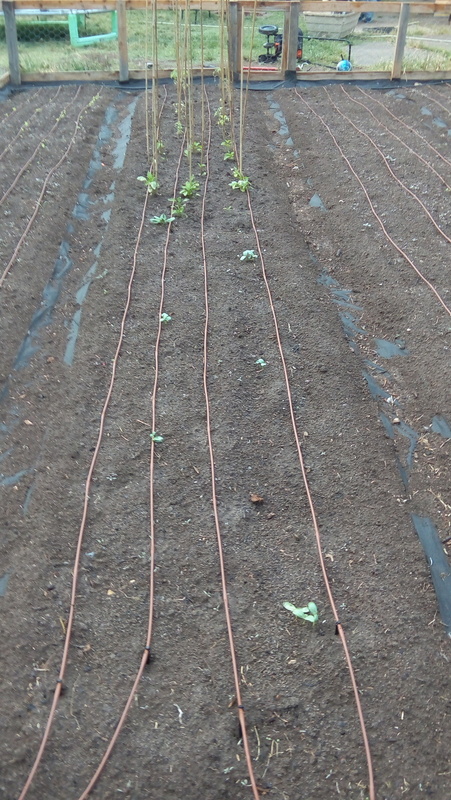 On the far left bed, I planted carrots to the the radishes that I left at the end. On the left middle bed, I planted all kale. 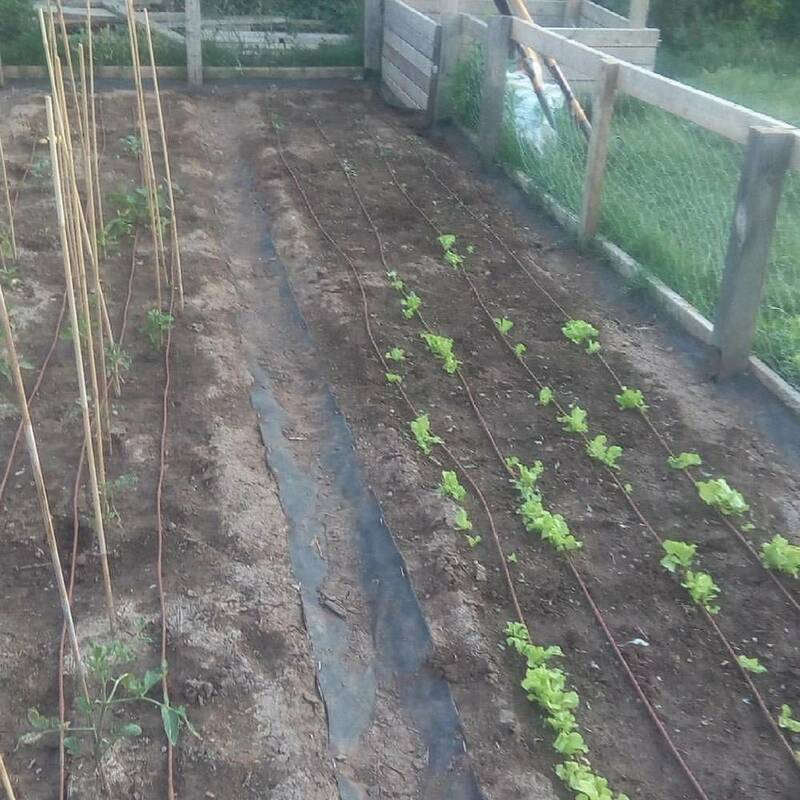 On the far right bed, I planted half lettuce and half spinach. Using the seeder this took me about 30 minutes to an hour. In the right middle bed, I planted 3 holes of cucumber and 3 holes of squash. Installing the drip irrigation system was alot easier than I thought it was going to be. 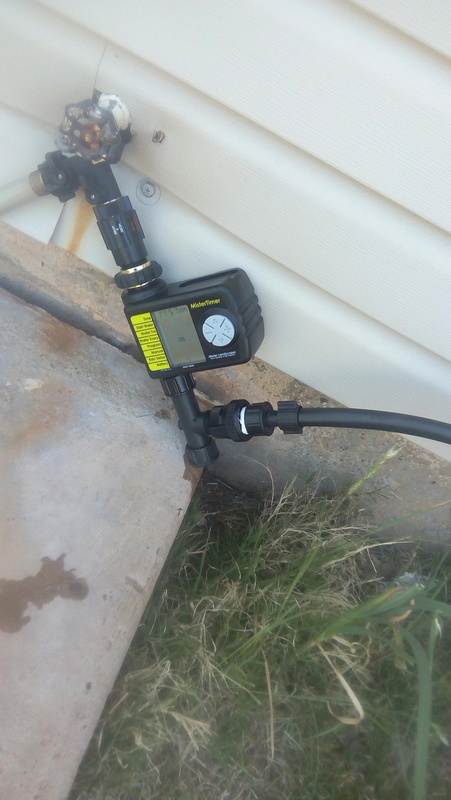 I bought a kit from Lowe's which included 1/2 inch tubing for the main line from the faucet, multiple connectors, and 100 feet of drip irrigation line, which was enough to cover one bed with 4 25 foot long lines spaced about 6 inches apart. So I purchased another 300 feet to cover the other 3 beds the same way. The kit also came with a punch that allows you to put a hole into the 1/2 inch main line to push connectors through it and connect the drip irrigation line to. Once I had the first bed done, the other three went pretty quick. I secured the 1/2 inch main line to the ground with left over landscape pins so that it wouldn't move and used support pegs at the end of each drip line to keep them in place. After about few days of letting the irrigation system run and keeping the bell peppers and tomatoes outside, I transplanted them in the front of the middle right bed. The tomatoes took some trauma in the transplanting. I have lost 2 so far but I think the rest will make it. The bell peppers transplanted with no problems. 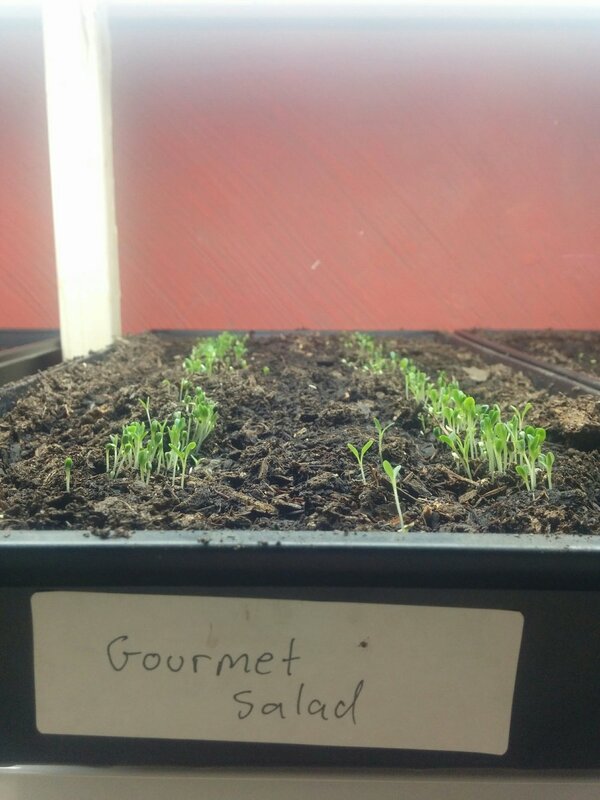 I cut the bottoms off of the jiffy cups I used to start the seeds and put a handful of organic compost at the base of each hole I made to for each plant. I also got some 4 foot tall bamboo stakes to use when they get taller to tying the plants to so that I can train them upwards. Everything that I planted has sprouted and the irrigation system is running every 12 hours for thirty minutes. Now all thats left is to sit back and watch it grow. And weed....so many weeds. I'll be updating every week or so just to show the progress of the plants. Its been another turn of the moon and the month has been jam packed with work, kids, and projects. After work 2 or 3 times a week, I've been helping Taylor's Dad work on stripping old paint off of their front porch. Its really old paint and has been baked on the wood paneling so the work to get it to come off is tedious and time consuming. That project has been taking up most of my time, so I haven't had much time in the garden except watering it occasionally to see if I can get the weeds and remnants of grass to sprout so that I can pull them out and couple of other things. Taylor decided she wanted a little spot to grow things too and pretty up the front of our house at the same time. Underneath our front windows, there is a 10ft x 4ft old flower bed that had grown over and was no longer looking very nice. She thought it would be a great spot to plant some flowers and some herbs but she also wanted something raised with a dark stain. I still had plenty of old wood from the backyard so I said that I could build her a flower box and get it all ready for her to plant some things in. I didn't have an 2x4s that were long enough so I had to cut 60.25' long pieces for the long sides and 42' pieces for the short sides. The middle was abit weak so I supported it with 2 42' pieces there to give it more stability. Then we stained it. 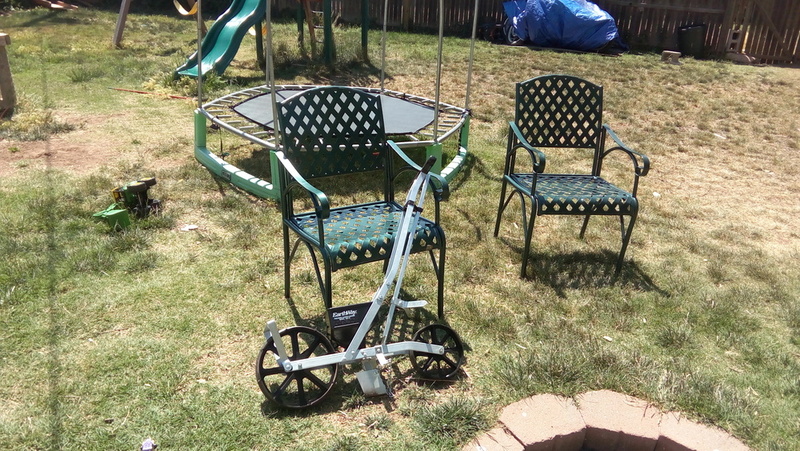 After we stained it, I moved it into place and then started filling it in with grass clippings from mowing the lawn. I decided to take out my little garden bed on the side of my house and use the dirt from there to put into the flower box. The dirt and clippings filled it up about half way. To fill in the remaining amount, I used vegetable and garden soil with fertilizer and 100% organic compost. It took 4, 2 cubic ft, bags of the soil and 2, 2 cubic ft, bags of the compost. I don't have a wheel barrow so I basically had to carry all the dirt, soil, and compost around. Needless to say, I was hurting the next day. The end result I think was totally worth it. Taylor planted some sad little pansies that desperately needed to be transplanted into the ground that she got from her grandmother, wild flower seeds, lavender, thyme, 2 types of chives, and rosemary. 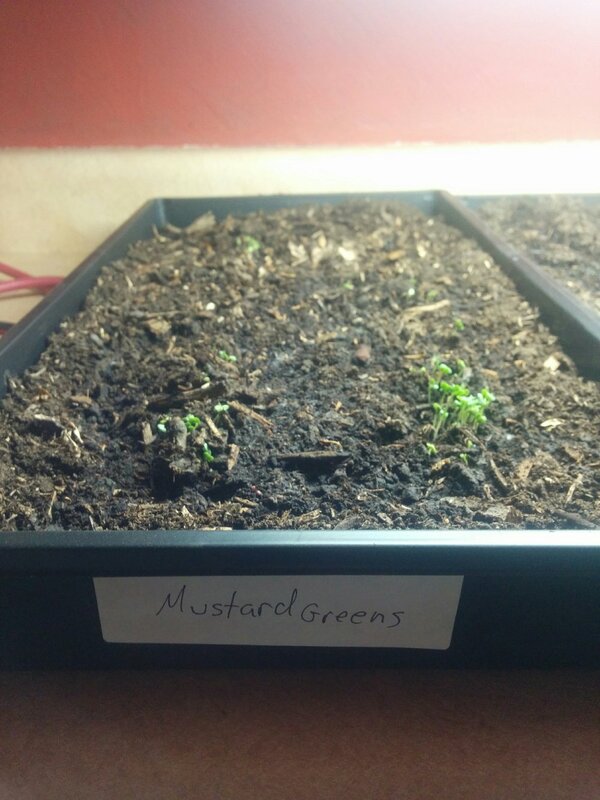 This was my first experience starting seeds indoors and boy was it an "experience." Also, I have never used Jiffy Cups before, so i had some trial and error setting them up. I planted tomatoes in 7 jiffy cups and bell peppers in the remaining 8. 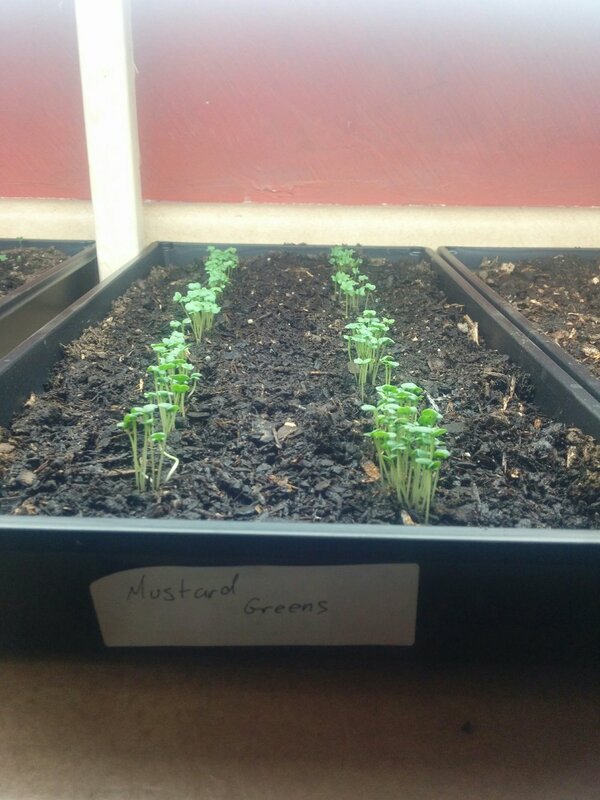 The first seed planting I had the jiffy cups sitting on an old cookie sheet. This didn't work because the soil got too dry. Then I reseeded the pots and put them into tupper ware bins and put some water about half way up the cups. This was way too much water and turned the tomato sprouts yellow. Then Cody decided to "help" and dumped all my radish seeds into the tomato sprouts. I couldn't just pluck the radish seeds out because they were everywhere. So I decided to carefully remove dirt until I could pull out the sprouts and put them into new soil in the same jiffy cup. This worked on 1 of the 7 tomato cups so I had to replant the tomatoes again. Since the radish seeds got wet in the tupper ware bin, I decided the only thing I could do was put them in the garden. I just pulled off a couple inches off the top of the farthest left bed and tried to spread them as best as I could from the bin. At the same time I decided to use the little greenhouse sprouter that I got. I did 1 row of bell peppers and 1 row of tomatoes just in case anything happened to the sprouts I had in the tupper ware. 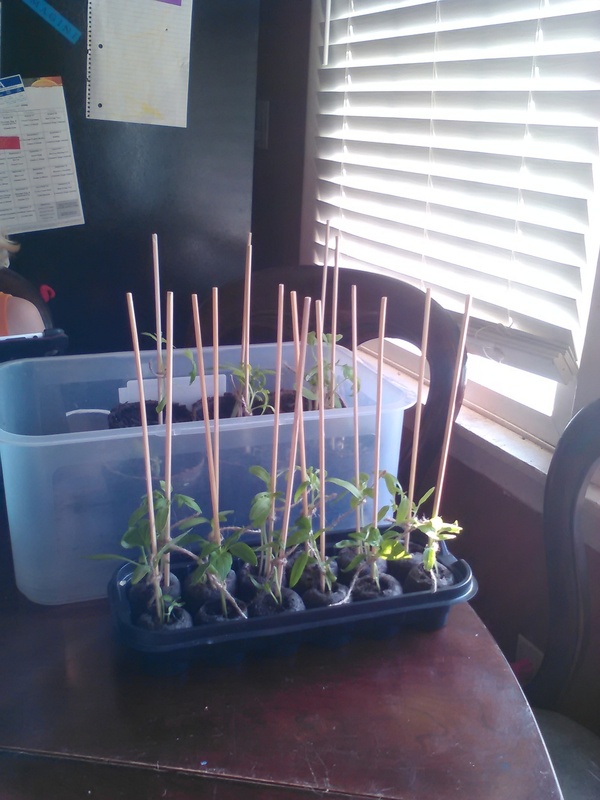 I had the newly seeded greenhouse on the far side of the tupper ware bins away from the window so when the the tomatoes sprouted they got all leggy because they were reaching for the sun. Now that I have all of that worked out, the last picture of the indoor spouts above is the current state of my seedlings. Nice and happy and coming along great. I'll probably transplant them in a week or two, depending on how they do until then and the weather forecasts on possible freezes. Also, my radishes are doing great in the garden bed. I wasn't holding out much hope but they just went crazy. It looks like I'm going to have a bumper crop of radishes. Laying down the landscape fabric was pretty straight forward. I bought 30'' wide landscape fabric. I measured out 25' and then cut it down the middle and folded one cut piece in half long ways. Then I staked it into the ground with landscape pins and walked it down the path putting a pin on each side about 10'' apart. I've done 2 paths so far. I have the third path and the perimeter left. To amend the beds I used the same soil and compost that i used in the garden box. I walked down each bed pouring the soil and then the compost over the top. After that was done, I took out my cultivator and mixed it in. That is done except for the patch of radishes. Next up on the agenda for me is finishing up the landscape fabric and then setting up the drip irrigation kit I purchased at Lowe's. Hopefully I'll be able to do both of those things in the next week or two so that I can transplant my tomatoes and bell peppers and start seeding the beds with carrots, lettuce, kale, onions, cucumber, squash, watermelon, and strawberries. I've learned alot in the past month. Its been frustrating and satisfying all at once. Check back soon, there is plenty more to do here at the Nuke-City Veg garden. after the second pass, I raked it again. After a couple weeks of sitting, the ground got really hard so I broke it up with a fork. I took the wheels of the cultivator, made it way easier. After the third pass, I roughed out the beds. Getting the plot ready has been both a chore and a relaxing, soothing activity. I have been at it now for about a month. Its been a long month too because process is long and drawn out working on it one week letting it sit and going at it again. Rinse and Repeat. In total, I have made 3 full passes on the plot with the cultivator. The first two passes were difficult because I had not used a cultivator before and I was still getting used to it. After the first two passes, done in one afternoon, I raked the entire plot and tried to make it as level as possible. Then I let the plot sit for a week or two. This turned out to be alittle problematic because when I started trying to do the third pass, the dirt had settled and gotten pretty compacted. The cultivator wasn't hardly getting into the dirt at all. I decided to break up the dirt using a fork. The entire process took me about a week, working in the evenings and then a Saturday afternoon. With the ground broken up, the cultivator did its magic. 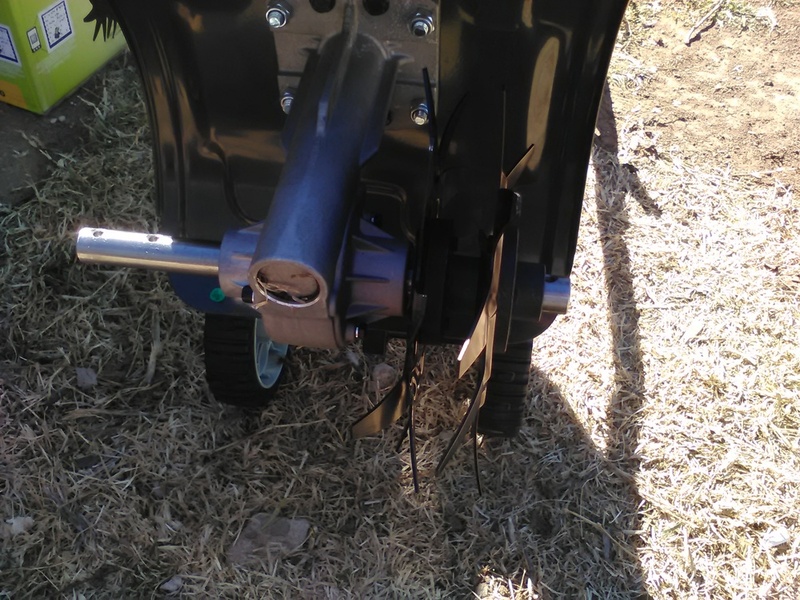 I removed the wheels and was able to move the cultivator around where I wanted it with ease. The aroma from the newly ground up dirt was great and gave me a sense of accomplishment letting me know that my hard work breaking the ground before hand had paid off. I still had a few big clumps of dirt but I was tired and satisfied with what I had gotten done so far. I decided to rough out the beds using a rake. To do this, I raked along the perimeter pulling the dirt into the plot about 6 inches all the way around. After one pass raking the outside of the plot, I used the vertical posts of the fence as guides to separate the beds about 6 to 8 inches apart. After this was done, I raked the beds flat giving them a some what raised profile. From here on out, I'm only going to working in the beds. The walk ways will be covered in landscape fabric and won't be used to produce anything so there is no reason to mess with them anymore. I have worked on the beds since the pictures above. As you can see from the roughed out beds picture above, where were still really big clumps of dirt in the 2 beds on the right side of the picture. I have since gone back with the cultivator and ground up the dirt some more making it smoother and reshaped the beds afterword. The two beds on the left are positioned almost on top of where the grass was. I've cultivated the middle left bed, raked out the grass, and reshaped it as well. The far left one is next and I plan to do this over the weekend. I will be repeating the process of cultivating and reshaping the beds for another month or so until the last frost of the year. Hopefully this will be late March early April. Until then there is still lots to do and lots to catch up on for posting to the blog so stop by soon. Its been over a month since my last post and tons of things have happened since then. First and foremost, I've changed the name to Nuke-City Veg. The name started out as a joke between my cousin and I. A couple months ago, I was looking for a podcast to listen to that would give me insight, tips, or advice on gardening, since I still don't know that much about gardening. I found PermaCulture Voices. Through this podcast I was introduced to high intensity farming and Curtis Stone. I purchased Curtis Stone's book, "The Urban Farmer: Growing Food for Profit on Leased and Borrowed Land" shortly after listening to a few podcasts featuring him on PermaCulture Voices. His story is amazing. He grows over $100,000 worth of food on about a third of an acre, in British Columbia, Canada. In his book, Curtis emphasizes very heavily to start small, so my little 400 sqft plot is just right and he inspired me to want to turn this into a business venture. I'm going to implement his systems and strategy on my plot and see what happens. In awe of what Curtis is doing in British Columbia, I was telling my cousin Nate Simmons about it and my grand scheme of turning myself into a farmer sarcastically. The first name that popped into my head for my farm was Nuke-City Veg because I live in Amarillo, Texas with a nuclear weapons facility Pantex just a few miles outside of town. There have been multiple social groups and a few business with Bomb City in the name but I didn't want to seem like I was co-opting that for my own purposes so Nuke-City was the obvious next choice. I'm going to be growing mainly vegetables so Veg for short. Nuke-City Veg it is. The other big change is moving web sites. If I'm going to embark on this journey with the goal in mind to sell vegetables, I need a better place to write about the garden, update potential customers with products, and have a way to sell somehow. Blogger just doesn't work for that. I've played around with SquareSpace but never actually setup any websites through their service. It was super simple to set this website up and get it going quickly. I'm really happy with it and hope you enjoy the new home and look of my little gardening journey. I know this was a quick post but I'll be cover the prepping the plot in the next post and it will probably be quite a long post. I had to do tons of work and I'm not really even done with it yet but the time has come to share more pictures and thoughts on my journey to becoming a gardener. Because I decided to move my garden into the backyard, I needed to build a little fence around it so my three dogs won't get into it and mess up my vegetables. As you can see from the last post, I have plenty of left over wood (2x4s and fence posts). I had 6, 8 foot, fence posts from the deck of the mini ramp. I first cut them into 2, 3 foot, pieces and 1, 2 foot, piece. The 3 foot pieces I used for the posts of the garden. I didn't put them very deep, between 6 to 8 inches. The 1 foot pieces I'll use for a flower planter in my front yard. After that the process was pretty straight forward, 2, 2x4's, cut to length, and screwed to the posts. My boys even helped with some of the work. Titus helped me dig the post holes and held the 2x4s in place so I could screw them to the posts and Cody held the screws from me. After the fence was framed, I measured and cut 2x4s vertically about half way in between each post to have something to staple the chicken wire to so it wouldn't sag between the posts. Next I walked the chicken wire around the fence stapling as I went and finally finished it off with a little gate. After about 2 weekends working on it, the fence is finally done. Now its time to till in the grass, rake, rinse and repeat. Then I'll have to decide how to shape up the beds, either north-south along the length of the bed or east-west along the width of the bed. First things first, on to the tilling. So a few years ago, I decided to build a mini ramp in my backyard. The thing was big, 16 wide, 25 feet long, and 4 feet tall. The ramp was a blast to ride...right up until the weather got to it and warped all the masonite. I was super bummed but never got around to fixing it up so it just sat in my backyard, a sad reminder of sport and passion from my youth. Not really but it was sad and slowly becoming a hazard. After my girlfriend moved in with 2 year old Cody, I decided it was probably time to tear it down. This was in the summer of last year, after I was seeing success with my little garden on the side of my house. I decided then that I had plenty of wood to recycle and that i could turn the huge unused area in my backyard into something I could use and get something back from, a bigger garden that hopefully with careful tending and attention would give me tons of vegetables and herbs. As you can see after day 4, there was a great space for a really big garden that rose out of the debris of rotting wood and disintegrating plywood. It was infested with ants, termites, spiders, and mold. Having the ramp in my backyard was great, but the time had come for it to go and make way for something new and productive. The new garden is already starting to take shape. This past weekend, I've started building a fence around the garden area. The only things I have left to do on the fence is putting up chicken wire and making a gate. More on that next time. Welcome to the Melius Backyard Garden!!! Thank you so much for stopping by to checkout my gardening blog. The Melius house consist of myself, Danny, my wonderful girlfriend, Taylor, my son, Titus, and Taylor's son, Cody. I started gardening 2 years ago. My first year was a disaster. The only thing I grew that year was mint, chives, and onions. It was terrible and I decided to just wait until the next year. Last year was considerably better. In addition to the mint, chives, and onions(that I didn't harvest), I planted 4 bundles of tomato plants, 2 rows of carrots which came out to around 20 carrots, 4 bell pepper plants, and 3 cucumber plants. All in a little 8' x 3' 9" bed, only about 30 sq ft. The feeling I got from successfully growing awesome tasting vegetables, that i grew without any knowledge really of gardening and without any fertilizers, was amazing. My kids loved the vegetables and they were gone in no time after harvesting. The bell peppers were crisp and delicious. The carrots were short and stubby but full of flavor. The tomato plants turned into a gigantic bush of tomatoes. It was fun hunting for ripe tomatoes and smelling the aroma of the tomato leaves as they were agitated reminded me of my mom's garden when I was a toddler. The mint we put into water and made our water taste wonderful. We harvested chives a few times and used them to cook with, adding a nice punch to anything we put them in. I did still mess some stuff up. The cucumbers I always left on the vine for too long and they turned bitter, which was a bummer because they are my favorite. I should have harvested the onions but didn't again. I think because I just got lazy and then all of a sudden they were seeding. Below are pictures I took over the course of last summer and fall. This year I will be moving my garden into my backyard. The garden is going to be huge compared to what I've done in that past 2 years. The rough dimensions will be 25' x 16'. Needless to say, the garden will be a handful and will take way more tending and care than my little tiny side garden. I'm excited though and looking forward to all of the fresh vegetables I'm going to be able to eat at my table. Again, thank you so much for stopping by and taking the time to read my little blog. There is for sure more to come in the future, so stop back by when you get the chance.